What is Predrilling in Providing Pile Foundation in Plastic Clay? The piles are the deep component of pile foundation system where some piles are embedded by thick embedment called pile cap. Any matter takes an amount of space just equal to its volume. The pile driven in the soil also takes its space and displacing, more accurately, a bit compacting surrounding soils. The plastic clay in saturated condition results a problem of displacing surrounding soil enough to disturb and sometimes result distress with a heaving phenomenon. This heaving sometimes pull out a bit surrounding piles driven previously, resulting losing its capacity to transfer load to the firm stratum to which it was designed for. Sometimes this pile is required to be redriven. Now redriven produce a solution for piles, but how the distress of surrounding structures can be recovered. For this situation a method of drilling is used which is called predrilling. Piling in this type of soil results another problem as follows. Sometimes lateral movements also associated with driving action. This problem is severe in unstable slope near the pile driving site. The severity reach extreme condition, when an existing excavation work or excavated site extends below pile driving level. 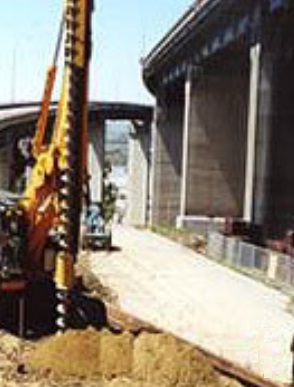 Another problem arises where a composite pile is used as foundation pile. The heaving action sometimes releases the connection of joint bet two separate piling materials that comprises a complete pile. So far we have discussed about problems of driving pile in such type of soil. Now we will learn how we can get rid of these situations. Where objections are coming from surrounding sites, slope failure is concerned, redriven produced extra cost and inconvenience to contractor, a method of removing part of soil from the space which is to be occupied by the pile. These method perform fairly good to avoid above situations. In this purpose usually a predrilling is done with auger, sometimes rotary cutting equipment with the action of water jets. This method of cutting with jet transforms the problem soil, clay into heavy slurry. This is good information! Thanks for posting it I have been trying to find some info on pre drill pilings for a paper I'm writing!! Great stuff!! thanks. Chuck I wonder if we're taking the same course. I as well have had to do research on pre drill pilings. What other places have you looked to get information? Wow! This is really neat. I was watching the end of a news report and I saw some things like this, but i wasn't sure what it was all about. Where are some other great online resources to learn about what pre-drill pilings are used for? Pre drilling piling is very important and can really make all the difference in the world too. I know that I personally would prefer to have this done before doing anything else. It will help out a lot more and really does make a difference.